Blood Libel, Church Burning and Sarah Palin. – Len Bilén's blog, a blog about faith, politics and the environment. Blood Libel, Church Burning and Sarah Palin. On “Blood Libel” Sarah has one point to make. Her own church got torched, children’s lives were at stake. Christians endure much. How much does it take? 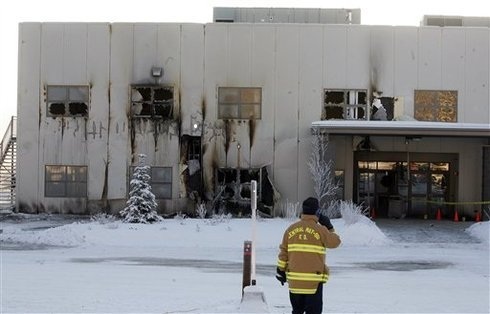 Sarah Palin, her husband Todd and up to 1,000 fellow parishioners will worship in a local school this morning after a suspicious fire virtually destroyed the Wasilla Bible Church early Saturday. Some women and children in a crafts group were inside at the time. Larry Kroon said some parishioners were in the church on Nicola Avenue at the time the fire was noticed but no one was injured. Firefighters battled for about eight hours in minus-20 degree temperatures to completely extinguish the blaze that began at the front door. The former Republican vice presidential candidate went to the church Saturday to apologize to pastors in case the estimated $1 million fire damages, suspected as arson, were “in any way connected to the undeserved negative attention the church has received” since the governor’s involvement with the church. Though several federal, state and local agencies were involved in the investigation, no arrests have been made, nor have any solid leads been announced. The media reported the fire and the subsequent determination that arson was involved, but quickly lost interest in the story. The Obama administration closed the federal part of the investigation. Previous Previous post: Conservative crosshairs or Liberal bullseyes? A Limerick. Next Next post: My testimony and the tragedy in Arizona.